Most of the outsized returns of companies since 1994 have used network effects. Having a network effect is the single most predictable attribute of the highest value technology companies — other than “having a great CEO.” 35% of those companies had network effects at their core. 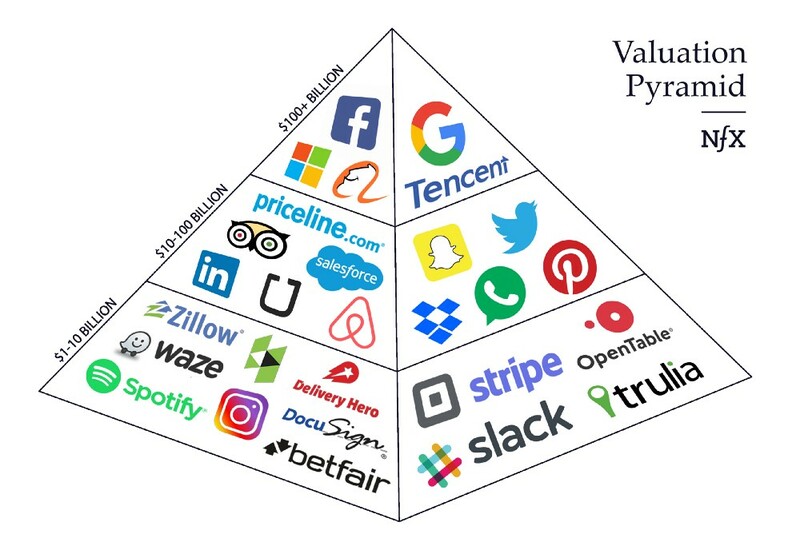 The other 65% of $1B+ companies used other defensibilities to create value — embedding, scale and brand. 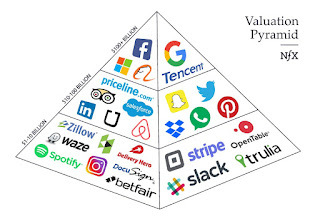 But those companies’ valuations top out in the $1-$2B range. Companies that leverage network effects have asymmetric upside. The Big 5 — Apple, Google, Microsoft, Facebook and Amazon — are hitting all time high valuations. Airbnb is worth more than Hilton in the private market. Uber is worth more than GM. The IPO track includes Spotify, Slack, Didi Chuxing and Dropbox. The other 65% of $1B+ companies used other defensibilities to create their value — namely embedding, scale and brand. These are good approaches, and created 219 $1B+ companies. 65% of the total. But those companies’ valuations typically top out in the $1-$2B range, leading to the results of this study. And yet surprisingly, only 20 percent of the business plans we came across before starting NFX Guild had network effects in them. Given their importance, it’s surprising there are only a few places to learn about network effects. We typically send people to HBS, Platformed, our thoughts on network effects and taxonomy with A16Z, NFX Essays, and other academic sources. We know the list of 336 is incomplete and many numbers debatable. We debated them ourselves. This was an exercise to get a solid estimate, not to be scientific or exhaustive. Given the large number of companies (336), and having played with many scenarios, we feel the conclusion about the power of network effects stands, and the 68% estimate is solid. When we first started building this spreadsheet in 2015, it first showed that 62% of value came from network effects businesses. That number has only increased since then. We omitted Microsoft entirely because — although it’s value has been driven by a network effect (a “two-sided platform network effect” to be exact) — it was founded before 1994. If we were to include MS, the percent to network effect companies would be over 70%. Amazon was considered 100% NON-network-effect because we consider Amazon’s core defensibility to be based on a scale effect, not a network effect. We included Apple in the calculation because we considered the company reinvented after 1994. However, we estimated that only about half of Apple business really had a network effect (iOS and iTunes). Thus, we put one half of Apple’s market value into the “network effects” pile and half into the “non-network effects” pile. Salesforce value was included, and split 50/50 between network effect and non-network effect. Salesforce is a 2-sided platform network effect. This analysis excluded: Silicon chip and switch companies like Intel, medical device and pharmaceutical companies, and manufacturing companies like FoxConn, which, while they are part of the digital world, were not software driven.